Argyle Embargo describe themselves as "a multi-genre indie group. Taking from multiple musical backgrounds including Classical, Jazz, Musical Theatre, Rock, Pop, Electronic and Folk traditions, they blend elements with an intimate knowledge of tonal harmonics and a deep love for making great music. The Beer Barrels - 'oompa music' from "a 3 piece Oompa-pa dance band who have been performing professionally for approximately the last 30 years." Ana Bon-Bon: swooning cabaret chanteuse back after a long stay in London. Konstantin Bozinov plays lute, guitar, and accordion with Bulgarian folk dance group Kitka. He specializes in East European folk music and has spent many years touring, playing at traditional weddings, and recording. He is also a professional lute player, specializing in renaissance and baroque music. Can Cala are Robyn Carrigan and David McCallum, a duo based in Vancouver specializing in traditional Gaelic song. Celtic Traditions - Michael Pratt and Lynn McGown: Fiddle, concertina, voice, and more. Crooked Road Band - promise 'Celtic music for all occasions', playing traditional dance tunes and folk songs from Ireland, England, Scotland, and elsewhere on button accordion, celtic harp, Irish bagpipes, and more. Dreadnoughts: Vancouver's biggest, baddest, drunkest, punkest Celtic band - https://www.facebook.com/thedreadnoughts or http://thedreadnoughts.com/. See them live in Prague! Don Embree - available for your function at reasonable rates. Lots of experience in different styles of music. Solo or with a band. Call Don at 604-721-8809. Illiteratty - cheeky jazz folk w. mandolin, guitar, accordion, bass, 4 vocals. Simon Kendall squeezing. Francois Laberge - romantic French-Parisian Musette style; also playing with Tanguisette. Late Thaw - or https://www.facebook.com/profile.php?id=1746266363 "a sound steeped in country, bluegrass and blues... new music with a traditional foundation rich in honkytonk, heartache and harmonies" - Simon Kendall on keyboards and accordion. Nuvo Zydeco - South Surrey's own taste of Louisiana. Dan Kahila on accordion. The Oktoberators - Oom Pa in Vancouver. Ready to serve up Octoberfest around the region all year round! Ken Oszinski - plays with 'oompa band' The Beer Barrels, and solo on old style music - polkas, waltzes, tangos, and more. Polka Time - Dreadnoughts polka spin-off. Redboot: A gypsy jazz quartet that took a left turn into Western swing? A Paris café band whose waltzes suddenly detour into wild Balkan dances? - w. Alison Jenkins on accordion. Back in 2015 after a while off. The Rheinlander Oompa Band is a Polka and Oktoberfest German band who make schunkeling fun. Sick Boss - all star Vancouver jazz group sometimes including Tyson Naylor on accordion. Amy Stephen - formerly of Mad Pudding, now w. Jou Tou - " the richness of the music is brightened with her celtic inflections and honest emotion." Todd Wong: Classical, Celtic and popular music, featured on radio and tv. Creator of Gung Haggis Fat Choy Robbie Burns Chinese New Year Dinner. Performs solo and with Black Bear Rebels Celtic Ceilidh Band. 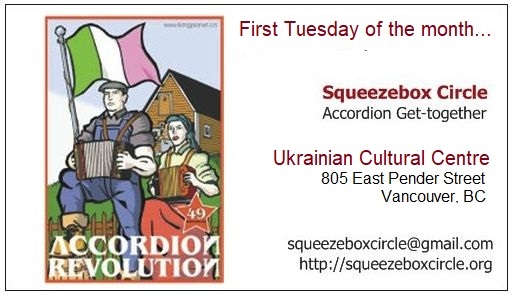 Cold Cut Combo is a Victoria gypsy jazz group with Aaron Watson squeezing button accordion. Elephant Island in Victoria plays music whose desperation is kind of warm and cozy, with an accordionist named Jamie Cummins. Jonathan Goldman sometimes takes a few moments away from the University of Victoria music faculty to squeeze out a tango on accordion or bandoneon. Meatdraw - grunge-folk, with some good songwriting - (Victoria) had Megan Boddy on accordion, but no resident squeezer anymore... Grayson Walker sometimes sits in. Grayson Walker, formerly with Frog Eyes, squeezes in Victoria along with J Maclaughan, and can often be found at the Logan's Pub Sunday Hootenany. Yiddish Columbia State Orchestra: Victoria 8-piece playing klezmer through bluegrass through New Orleans jazz; Marion Siegel squeezes. Blackberry Wood: folk-rock dance cabaret band; anyone know if they still have an accordion player? Joanna Chapman-Smith (now back home in Toronto) - "makes you want to dance with the gypsies"
Good for Grapes - "a six piece freight train of folk music," - Sean MacKeigan is no longer on accordion - pity! Maria in the Shower: like "early Chet Baker with the kick of a mule carrying half its weight in dried chili peppers", with Jack Garton on accordion: http://www.mariaintheshower.com/ or https://www.facebook.com/mariaintheshower. Read the Georgia Straight article about 'em. Mojo Zydeco: BC's premier Zydeco band - Sue Baines on accordion. Hear 'em on Accordion Noir radio... played their last Mardi Gras in 2014. Nothofagus or - https://www.facebook.com/pages/Nothofagus/92783258418 Acousmatic / Tape music / Folk / Minimalist, from Brittany to Chile to Vancouver - now back in France! Marian Rose- folk dancing, square dancing, old time social dancing, and accordion too! But now in Chicotami Quebec. Jennifer Andersen - teaches beginner to intermediate piano accordion plus voice, piano, musical theatre, etc. 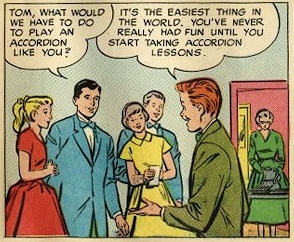 Specializing in accordion coaching as a special skill for singers/actors/performers. Konstantin Bozhinov teaches classical and improvised accordion music to all ages and ability levels, both privately and at the Vancouver Community College. Robyn Carrigan offers beginner accordion, guitar, and piano lessons along with singing lessons. Celtic Traditions - Michael Pratt and Lynn McGown: celtic concertina, fiddle, harp, bodhran, mandolin, voice, and more. Alison Jenkins - Beginner to intermediate students, kids or adults are fine; comfortable teaching people who want to learn by ear OR by sheet music. Specialities: Folk, Celtic, Eastern European styles. Can make house calls around Vancouver, or teach out of a studio. Dr Ross is a qualified piano accordion teacher and seeks students of all ages, youngsters especially. He uses both the Palmer-Hughes method books and his own materials. Contact Dr Ross at cell: 604 340-3348 or check his website at www.musiconnex.com. Cheers! Richard Tyce - http://www.skweezebox.com . Professional, working accordionist and teacher for over 30 years. All kinds of styles. Close to Kootenay Loop in Vancouver. In person or via Skype.